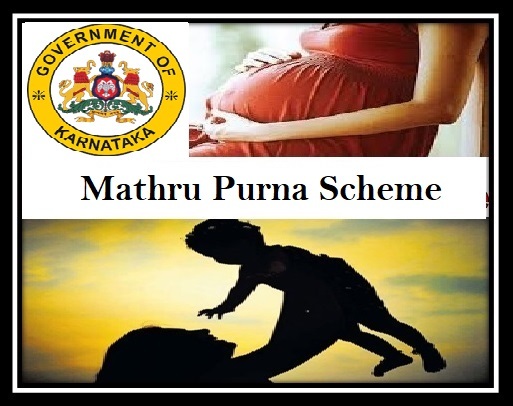 The Karnataka Mathru Purna is a scheme which deals with providing nutritional food to the pregnant ladies. Under this scheme, the government aims towards giving at least one healthy meal to the underprivileged women every day. The scheme is targeting the rural areas. Objectives: The objective of this scheme is to provide healthy meal to the pregnant mothers and also to educate the masses on pre-natal health care and diet. Food: To carry this scheme forward, the government shall give pulses, eggs, vegetables, groundnut-jaggery chikki and other such products to women who are pregnant and lactating. Alternatives: For those women who do not consume eggs, the government will provide two kinds of sprout to meet the physical needs and deficiencies. Meal time: The scheme will provide free meals for pregnant women for 15 months from the beginning of pregnancy till 6 months after delivery. This means that it will continue till the time the child is still breast feeding. Cost of meal: The cost of each of the meals would be around Rs. 21. This is the estimated cost the actual cost may slightly differ depending upon the prices in the market. Availability: The Aanganwadi workers can change the diet or the menu of the items, in case the items are not available in the market or in case the food list does not match with the preferences of the beneficiary. Planned meals: The meals are made specifically with the view of meeting the nutrition index of a pregnant or lactating mother. The aim is to provide the mothers with food that will benefit both hers and the child’s nutrition. Effects of the scheme: With this step, the state will be able to control and curb one of the biggest contributors of child mortality – malnutrition. To get the benefits of this scheme, you will have to belong from rural areas or underprivileged sections of the society. Also, you must be either pregnant or lactating. If the pregnant women are suffering from any sort of nutritional deficiency, then this scheme would cover it up effectively. It would help improve the health of both the mother and the child. At the same time this scheme will help propagate the message that the pre-natal and post-natal nutrition is important to consider. The budget is kept in mind viewing that the Anganwadi workers will also be able to change the list of the items mentioned in it. The budget was allocated effectively in July 2017 for the implementation of this scheme. As per the list that is prepared, the scheme will be able to cover about 40% of the nutrition of the mothers per day. This means that it will partly cover the deficiency of protein, calcium and so on. The health index of the mothers of Karnataka is very poor and hence it is a very welcome step. The government launched a scheme for pregnant and lactating women in 2016-17. It was aimed towards the backward taluks and the budget for this scheme was around Rs. 42 crore. However, for the Mathru Purna Scheme, the government has announced a budget of Rs. 302 crores. This will help implement the scheme effectively in all the 30 districts towards which it is aimed. This scheme will take place for the financial year 2017-18.